It’s really, really great when you have thoughtful friends who know you well enough to buy you gifts of gin. Those are the kinds of friends that you hold onto for dear life because a friend who knows your favorite spirit is a special friend, indeed. My dear friend Lori Rice of Fake Food Free is just that kind of thoughtful friend! A few weeks ago, I was surprised and thrilled to receive a package in the mail from her containing an entire set of St. George Spirits Gin as a wedding gift! The set came with their 3 signature gin varieties: Terroir, Botanivore and Dry Rye. St. George Craft Distillers hails from Alameda, California, which just happens to be Lori’s stomping grounds. It’s no secret that Gin is my favorite spirit. I love it because the flavors in gin so easily combine with fresh herbs and I love cocktails that taste like they’re fresh from the garden. Since I was unfamiliar with this particular brand of gin, I was very excited to hold a little tasting for myself in order to get to know these gins in their purest form–just a little sip in a glass, without ice. I found Terroir particularly fascinating, yet somewhat challenging. Terroir is distilled from local botanicals: Douglas Fir, Bay Laurel, sage. This gin was very piney on my tongue and at the onset I wasn’t sure what flavors I wanted to pair with it, so I gravitated toward the Botanivore, which is sweeter and more familiar. It wasn’t until the Husband decided to make the Apollo Cocktail from Mr. Boston Official Cocktail Guide, that I discovered exactly how to showcase the earthy and evergreen notes of the Terroir. 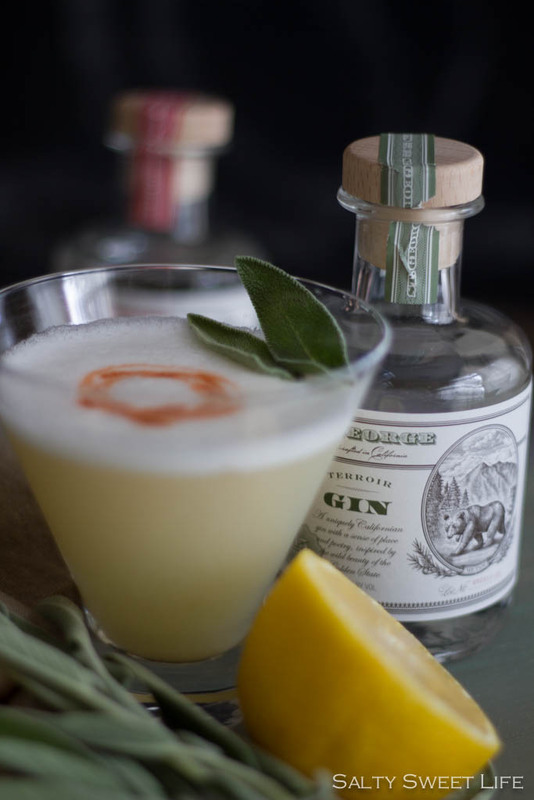 It makes perfect sense that a sage based cocktail would complement and amplify the sage, juniper and fir notes in the Terroir. I was actually quite stunned at how amazing it was and immediately wanted to share it with you! I have made this drink with Hendrick’s Gin, which is sweeter than Terroir and more similar to Botanivore. It is delicious with both varieties, but the earthy complexity of Terroir combined with the flavors of ginger and sage won me over, hands down. I haven’t had a chance to experiment with the Dry Rye yet, so if you have any suggestions for me, please leave them in the comments! I hope you all have a great weekend! 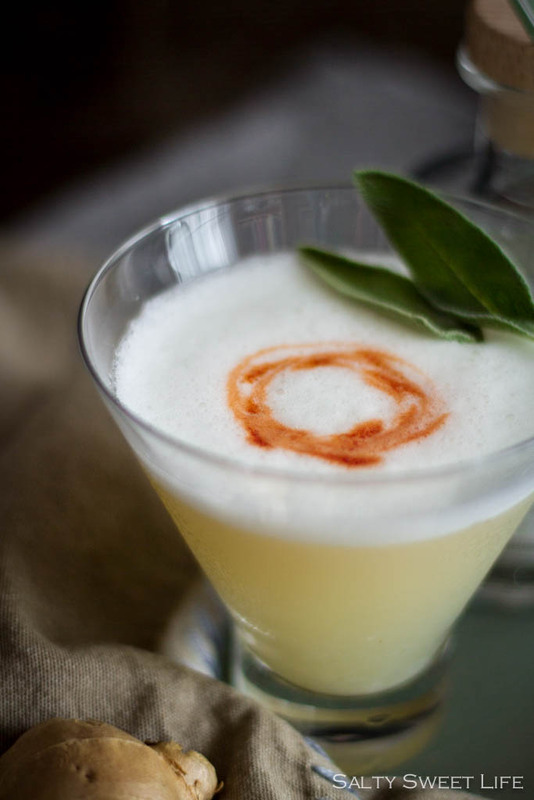 This cocktail contains raw egg whites, which gives it a creamy, frothy cap, but do not fear–the alcohol and citrus in the cocktail will neutralize the risk of salmonella. A word of warning, though–be sure to use a Boston Shaker for this drink. We made it in a Cobbler style shaker the first time and it exploded all over the kitchen (the foamy egg whites causes pressure to build and the top blew right off). That was 3 ounces of this amazing gin literally down the drain…and on the curtains…and all over the floor. 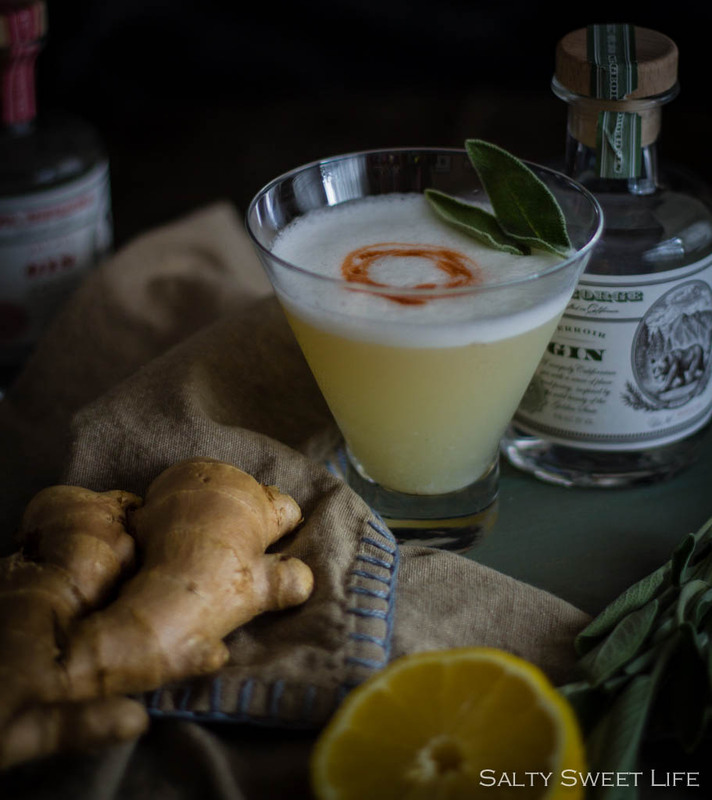 In the glass portion of a Boston Shaker, muddle the sage leaves and the ginger root until well pulverized. 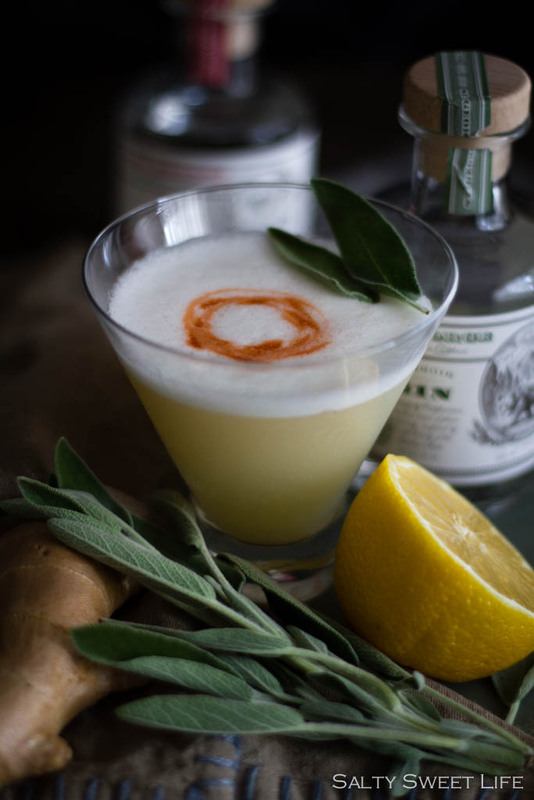 Add the gin, lemon juice, simple syrup and egg white and add ice to the level above the liquid. Shake as vigorously as possible for 30 seconds or until the liquid is frothy and foamy. Immediately strain into a chilled cocktail glass. Add six drops of Angostura bitters in a circular shape in the foamy cap of the cocktail. With a straw, connect the dots, forming a circle. 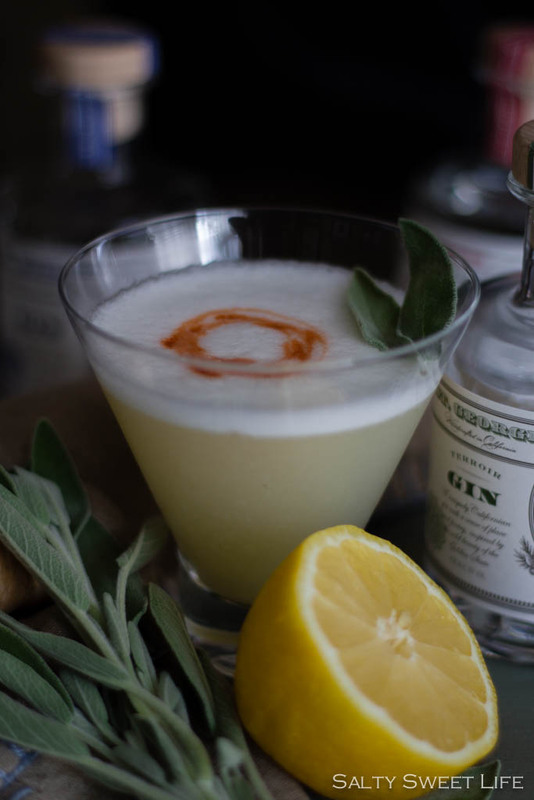 Garnish with a fresh sage leaf. Now that is a friend! Your photos are AMAZING! I knew that I wanted to grow sage this year from some reason 🙂 We had a cocktail with egg white and enjoyed it. Will be saving this one for day-time or night-time or anytime drinking! I’ve never tried growing it so if we ever get warm enough I will try it. We had wind chills of 22 last week. Stinks! oh good lord! That’s just nonsense! Thank you Lori! You are so awesome! This gin is definitely going to become a favorite of ours! Wow. And love Tracey. Such a thoughtful gift. Gorgeous cocktail photos that have me longing to day-drink, with you 🙂 I’ve been slowly warming up to gin, embracing it as a cocktail ‘ingredient’ rather than a star. It has so much to offer. You’ve got a winner here. Thank you so much Libby! It’s a tough life…having to day-drink to get photos! Ha! It was such a thoughtful gift. Thank you so much Cydnee! I always look forward to it!